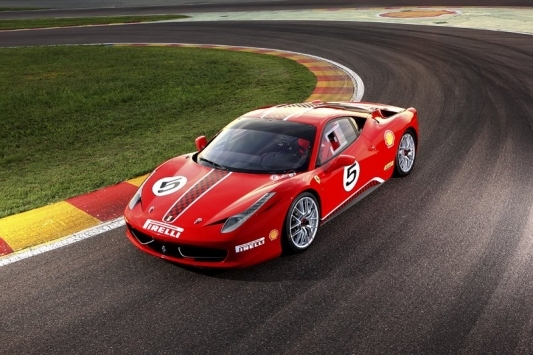 It was only a matter of time before the 458 conquered the track. Since 1993, Ferrari has been giving owners the opportunity to race in a “gentlemen-driver’s” series using race-prepped, non-production models. Four special race models have been used in the 17 years of the series, producing some of the most competitive and thrilling races in motorsports. Running alongside the F430 Challenge, the fifth race model in Ferrari’s Challenge Series, the 458 Challenge, was introduced at the Annual Dealer Meeting in Maranello, Italy. Turning the 458 Italia into a competition-ready racer are a few modifications designed to create a more dynamic mid-engined motorsport machine. Powered by the same 4.5-liter, direct injection V-8 as the road-going 458, the same 570 hp at 9,000 RPM is carried over in the Challenge model. The 458 Challenge however, features a recalibrated dual-clutch F1 transmission with modified gear ratios to produce more torque at lower RPMs. To meet the demands of racing and provide a more dynamic and responsive ride, Ferrari had to revise the suspension and wheel setup on the 458 Challenge. Lowered by 30 mm (1.18 in.) and fitted with new single-rate dampers, stiffer springs, and solid aluminum bushings, the 458 Challenge can achieve a lateral grip of up to 1.6G. New 19-inch racing wheels feature a center nut, and wear Pirelli racing slicks for extreme traction. Behind the race-spec wheels are powerful new generation Brembo CCM2 brakes that first appeared on the ferocious Ferrari 599XX. To ensure a perfect balance of control for the driver, Ferrari has equipped the 458 Challenge with a number of electronic aids. Helping to maintain massive amounts of grip is the F1-Trac traction control system that is integrated with the E-Diff electronic differential to ensure proper wet or dry traction. Engineers also installed a high-performance ABS system that boasts two configurations: low grip for wet surfaces, and high-performance for dry. The E-Diff, ABS, and F1-Trac systems can be controlled via steering wheel for effortless adjustments. Engineers also focused on reducing the weight of the 458 Challenge by utilizing carbon fiber and Lexan, as well as reducing the thickness of body panels. The weight loss and chassis upgrades led to a new lap record of 1’16.5” around Fiorano – two seconds faster than the F430 Challenge. The 458 Challenge will make its debut during the 2011 Ferrari Challenge Series. A new Asia-Pacific championship will be included along with the championships in Italy, Europe, and North America championships for the 2011 Series. Suspension: Single-rate dampers, stiffer springs, solid aluminum bushings, lowered 30mm. Have you ever participated or attended the Ferrari Challenge Series? Leave a comment and let us know!